Gaman er að búa til sina eigin kennslumyndbönd. Nemenda eru áhugasama um það og hægt er að sýna þeim aftur og aftur til að rifja upp. Fyrir heimilisfræðikennslu hef ég búið til blogg þar sem flestir uppskriftir eru aðgengilegt. Þetta hefur hjálpað mörgum nemendum að prófa skemmtilega og einfalda réttir lika heima. Myndina hér er frá þýsku blogginu castlemaker. Inspired by the work of my colleague Inga Harðardóttir I ran this workshop with my first graders: we collected snow in jars, coloured it with ink and added the colourful ink to cardboard. Í kerfinu er ég að bræða saman eigin uppgötvun og þekkingu sem ég hef safnað undanfarin þrjú ár í meistaranáminu í hönnun og diplómanáminu í listkennslufræði. Þessi þrjú ár voru tileinkuð tilraunum, lestri, samtölum, samvinnu, sköpun, endurskoðun og listrænum rannsóknum. En það mikilvægasta framar öðru er leik- og sköpunargleðin sem ég fann í öllum þáttum tengdum flugdrekahönnun og eru leiðarljósið í mínum hlutverkum sem hönnuður, foreldri, mentor, íbúi og manneskja. Kerfi er rammi, gluggi eða hurð sem hægt er að horfa í gegn um undir mismunandi hornum. Hringlaga flugdrekar af mismunandi stærð og úr mismunandi efni finna skjól í rammanum en eru tilbúnir til að taka á loft til dæmis sem samtengdir „diskar“ í kínverskum slönguflugdreka. Ég var að leika mér við þrykkprentun, ljósritun og handteikningu af kerfum sem eru spíralvafin og eiga uppruna í náttúrunni eða eru manngerð. Þessi kerfi prentuð á hringlaga „einingar“ eru svo í „samtali“ við hvor aðra, alveg eins og manneskjur sem eru kerfi, samtengd og jafn mikilvæg öðrum kerfum. Pappírinn er silkipappír úr umbuðum, flugdrekapappír, lochtapappír frá Nepal, kínverskur pappír, rekja pappír og pappír úr prentsmiðjunni í Laugarnesi. 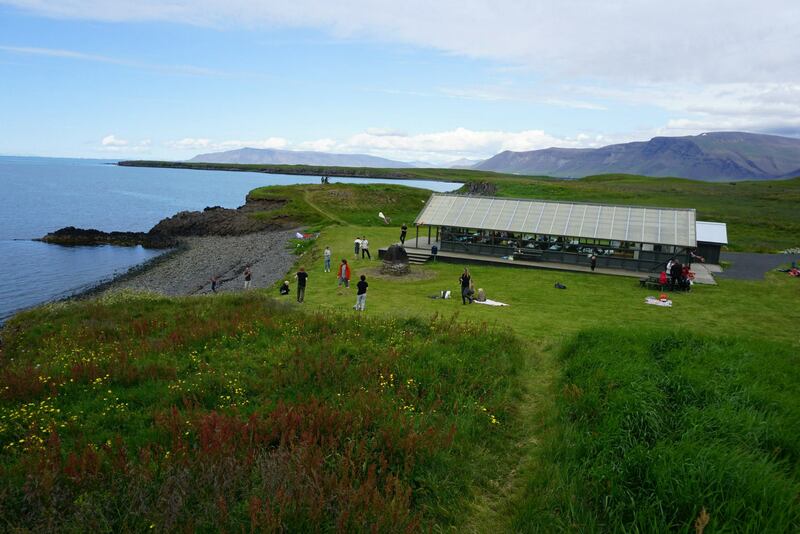 Auk þess saumaði ég flugdreka úr efni sem ég fann í nytjamarkaði. Ég tálgaði bambus og greinar sem ég fann á gámastöð daginn fyrir sýninguna og notaði bókbandssnæri og trélím til að festa allar tengingar. Efnið í rammanum er að hluta til úrgangsefni frá byggingarstað. Kerfi er undirbúningur fyrir gagnabankann og fræðsluvefinn Loft&Vatn sem ég fékk námsmannastyrk fyrir og er ætlaður grunnskólakennurum og nemendum. 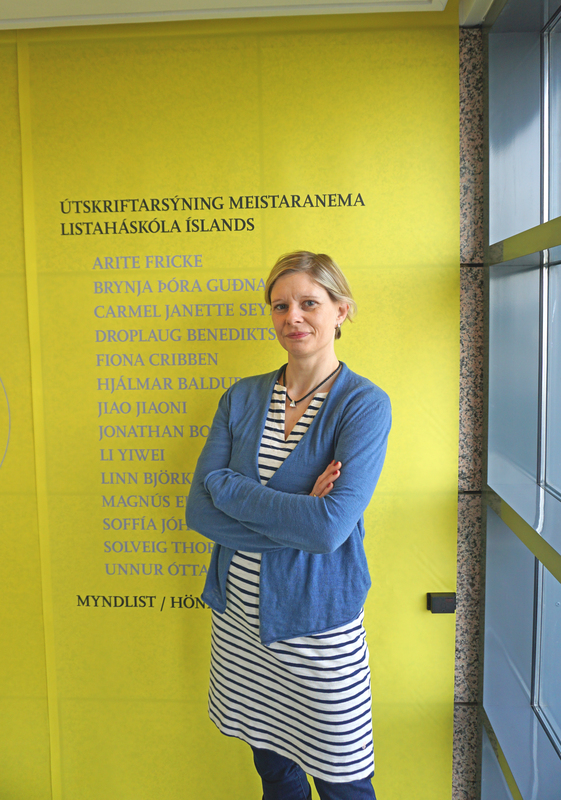 Þar á að vera hægt að leika sér, fá innblástur og deila lifandi og skapandi kennsluverkefnum í anda pósthúmanistiskrar menntunnar. Ég þakka öllum þeim sem hjálpuðu mér við hugmyndavinnuna, prentun, smiði og uppsetningu á þessu verki hér í Listaháskólanum og heima hjá mér. This creative model by John Wood has been leading me through my professional and private life since I studied at the masters department at the Icelandic Academy of the Arts (2013-2015). 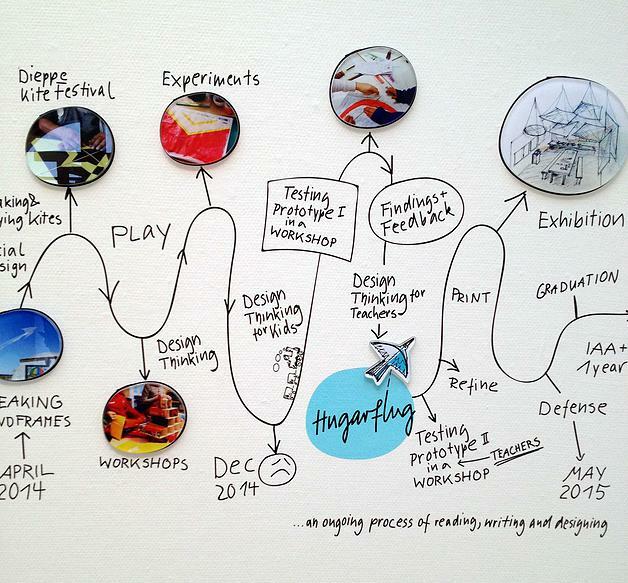 My master of design project “Hugarflug Playful Workshops” is an ongoing project, which aims to improve peoples creative confidence and sense of social inclusion through applying methods stemming from Design Thinking. Hugarflug is the Icelandic expression for brainstorm. Literally translated it means flight of the mind. 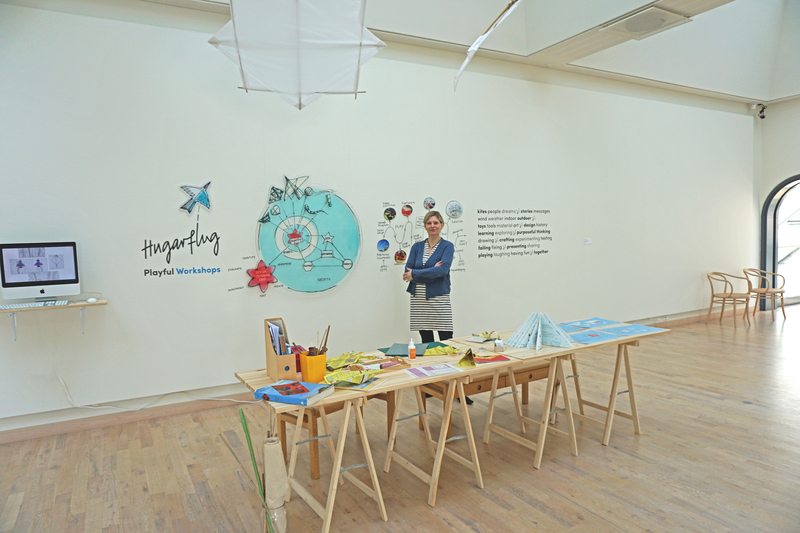 It combines the two main concepts of my research which are the design thinking approch (hugar = mind or thoughts), applied during playful kite-making workshops (flug = flight). This approach aims to teachers that want to apply creative methods and activities to meet their students needs for education, play, interaction, creativity and movement. Design Thinking is open-ended and therefore creative. It means the outcome is not predefined. Regarding Hugarflug, the goal is to have the group members come up with as many different ideas for kites as possible. 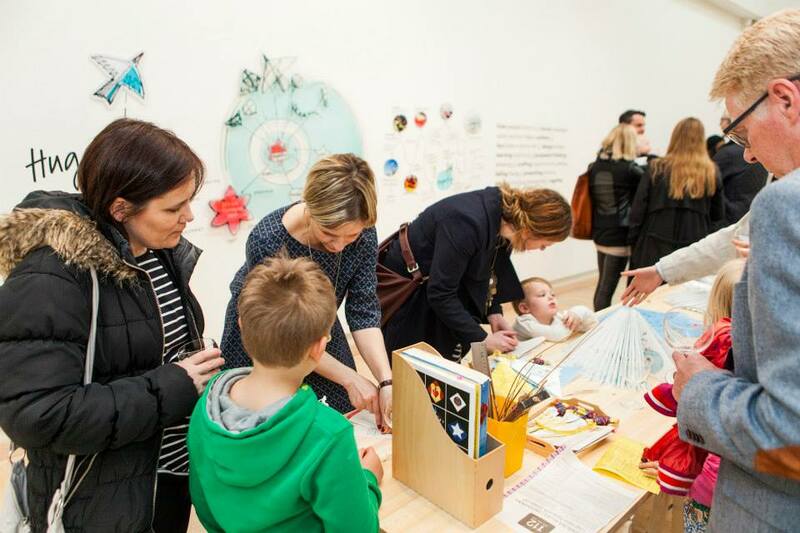 Hugarflug Playful Workshops aim to follow upon methods stemming from Design Thinking as developed by Charles Burnette in the field of education since from 1989 onwards. This creative method enables children to solve tasks and problems with their needs and interest in mind. The method improves the thinking skills of children when focusing on a task and helps them to collect experiences through playing, learning, building, failing and succeeding in a group. Children gain deeper knowledge on a topic they are familiar with and they can emotionally connect with. This connection than motivates them to seek a solution. Since Design Thinking is an open-ended hence creative approach, no pre-defined solution is at hand. Hugarflug adapts methods stemming from Design Thinking because they mediate its main visions of increasing children’s creative confidence and sense of social inclusion playfully. The workshops simultaneously provide resources and space for hands-on experimenting and prototyping, which improves handicraft skills of its participants. The overarching aim of this collaborative project is to tackle social isolation and lack of self-confidence of children who are facing poverty in its diverse levels. During playful kite-making workshops, methods stemming from Design Thinking are introduced to the children. The workshops especially emphasize the playfulness of the activity and the interaction between the people involved. Through learning about the history, mathematics, physics, art and design of kites, participants empathize with the topic and develop ideas together, which will thus have an impact on the sense of social inclusion. Small-scale prototypes are built and tested so that these can improve further. In designing something unexpected and innovative, children will gain the confidence of being able to creatively respond to the challenges that they will be faced with, now and in the future. “Aðalnámskrá Grunnskóla.” Mennta- Og Menningarmálaráðuneyti. Accessed January 23, 2015. http://www.menntamalaraduneyti.is/utgefid-efni/namskrar/adalnamskra-grunnskola/. Augustsdottir, Asrun. Kite Factory. Vimeo video, 3:02. April, 2014. https://vimeo.com/94641393. “Breaking Mindframes.” Cargocollective.com, February 2015. http://cargocollective.com/together_lhi/Breaking-Mindframes-2014. Brown, Stuart. “Play Is More than Just Fun.” TED video, 26:42. May, 2008. http://www.ted.com/talks/stuart_brown_says_play_is_more_than_fun_it_s_vital. “Colour Lokta Papers.” Khadi Papers. Accessed February 11, 2015. http://khadi.com/shop/category/colour-lokta-papers/. “Creativity in Design Thinking.” Accessed April 12, 2015. https://www.academia.edu/3737301/Creativity_in_Design_Thinking. Design & Thinking. “Design & Thinking Official Trailer”. YouTube video, 2:27. April 26, 2012. https://www.youtube.com/watch?v=uilcaXYnluU&feature=youtube_gdata_player. “Fátækt: Barnabætur Verði Auknar Og Lágmarksframfærsluviðmið Skilgreint.” Accessed February 14, 2015. http://www.barnaheill.is/Frettir/Frett/fataektbarnabaeturverdiauknaroglagmarksframfaersluvidmidskilgreint/. “Five-Minute Film Festival: Design Thinking in Schools.” Edutopia. Accessed February 16, 2015. http://www.edutopia.org/blog/film-festival-design-thinking-in-schools. Fricke, Arite. “Arite-Fricke-MA2-2014-1, 2014.” Vimeo video, 2:36. September, 2014. https://vimeo.com/105187179. Fricke, Arite. “Arites Kite Sled.” Vimeo video, 0:25. March, 2015. https://vimeo.com/123367559. Fricke, Arite. “Dieppe International Kite Festival 2014.” Vimeo video, 5:49. April, 2014. https://vimeo.com/125200040. Fricke, Arite. “Kite-Flight-27th of April 2014, 2014.” Vimeo video, 0:30. April, 2014. https://vimeo.com/93293406. Fricke, Arite. 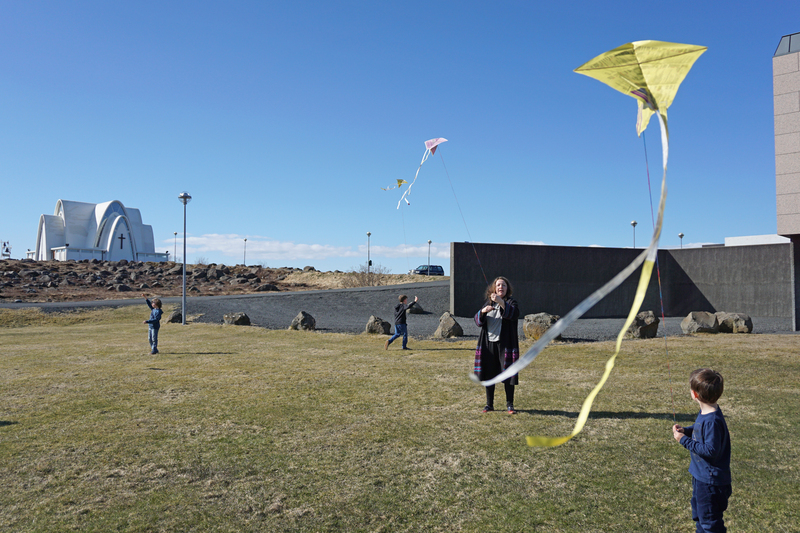 “Prototype Kite Flight – Sunday the 27th of April 2014.” Vimeo video, 2:58. April, 2014. https://vimeo.com/93142366. Fricke, Arite. 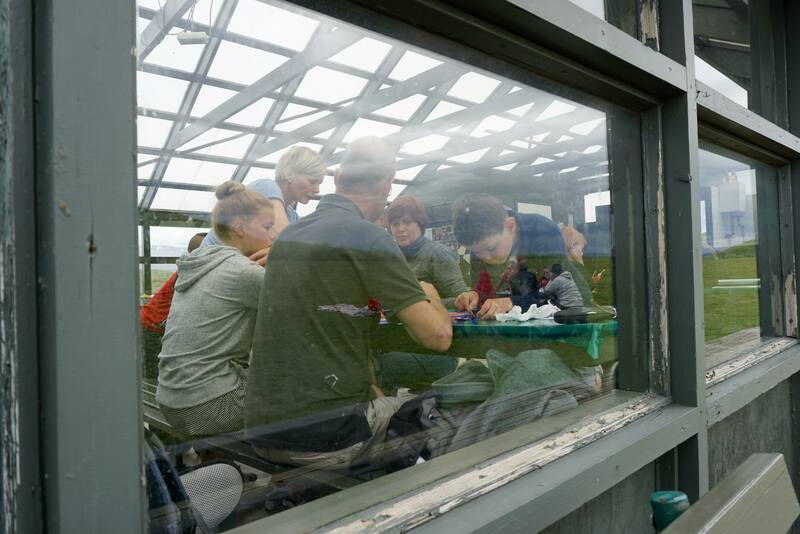 “Want to Build a Kite?” Hugarflug Playful Workshops. Accessed April 25, 2015. https://aritefricke.wordpress.com/want-to-build-a-kite/. “Frístundakortið Verður 35 Þúsund Krónur Á Barn Árið 2015.” Reykjavíkurborg. Accessed February 14, 2015. http://reykjavik.is/frettir/fristundakortid-verdur-35-thusund-kronur-barn-arid-2015. Goethe-Institut Osaka. Pictures for the Sky: Art Kites = [Sora Mau Kaiga: Geijutsu-Dako]. Edited by Paul Eubel. Osaka : Munich : New York, NY, USA: Goethe-Institut ; Prestel ; Distributed in the USA and Canada by te Neues Pub. Co, 1992. Gray, Peter. “Definitions of Play.” Scholarpedia 8, no. 7 (2013): 30578. doi:10.4249/scholarpedia.30578. Hart, Clive. Kites, an Historical Survey. Rev. and expanded 2nd ed. Mount Vernon, N.Y: P.P. Appel, 1982. “How to Make Kites with Kids.” The Big Lunchers. 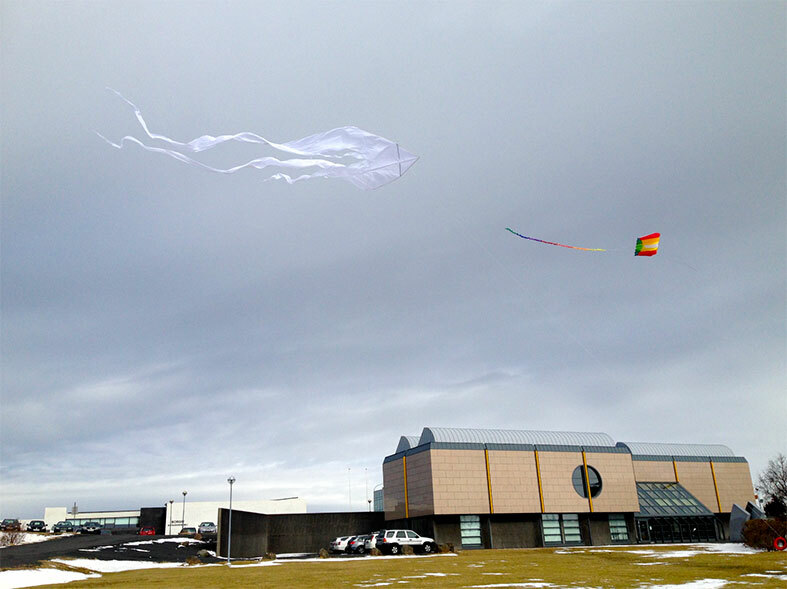 Accessed April 19, 2015. http://www.thebiglunchers.com/index.php/2013/08/how-to-make-kites-with-kids/. 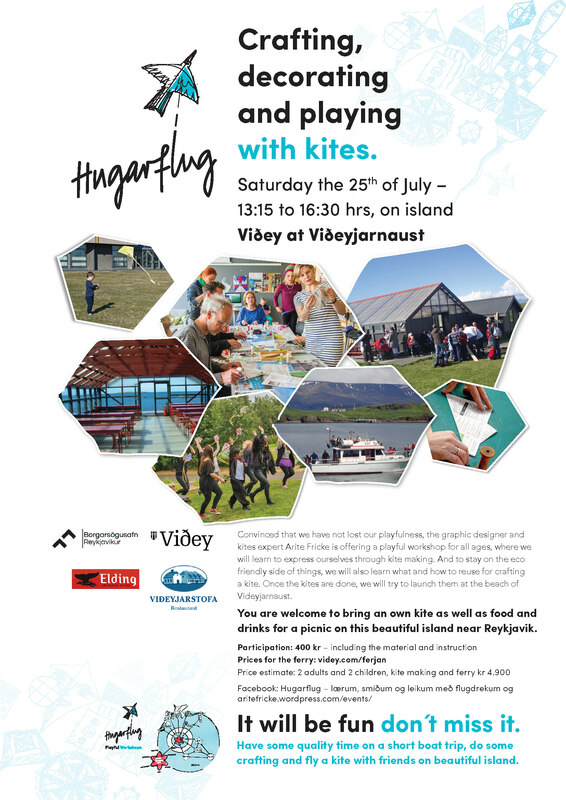 “Hugarflug Playful Kite-Making Workshops for Elementary Schools.” Hugarflug Playful Kite-Making Workshops for Elementary Schools. Accessed April 19, 2015. https://aritefricke.wordpress.com/. Huizinga, Johan. Homo Ludens: A Study of the Play Element in Culture. London: Paladin, 1971. Keil, Steve. “A Manifesto for Play, for Bulgaria and beyond.” TED video, 17:56. January, 2011. http://www.ted.com/talks/steve_keil_a_manifesto_for_play_for_bulgaria_and_beyond. “IDEO. A Design and Innovation Consulting Firm.” Accessed November 30, 2014. http://www.ideo.com/about/. “IDESiGN. The Goals for Teaching Design Thinking.” Accessed January 8, 2015. http://idesignthinking.com/01whyteach/01whyteach.html. Karlsson, Bjarni. Children living with relative poverty. Audio recorded interview, February 5, 2015. Lambert, Bruce. “How to Split a Bamboo Pole.” YouTube video, 9:31. August, 2008. https://www.youtube.com/watch?v=oXFy_OQRPzY&feature=youtube_gdata_player. Laverne, Lauren. “Why Play Is Important to Us All.” The Guardian, October 5, 2014, sec. Life and style. http://www.theguardian.com/lifeandstyle/2014/oct/05/why-play-is-important-to-us-all-lauren-laverne. Miettinen, Satu. Design Your Action: Social Design in Practise. Helsinki: University of Art and Design, 2007. Munari, Bruno, and Patrick Creagh. Design as art. London: Penguin, 2008. Munari, Bruno, and Museum fur Gestaltung Zurich. 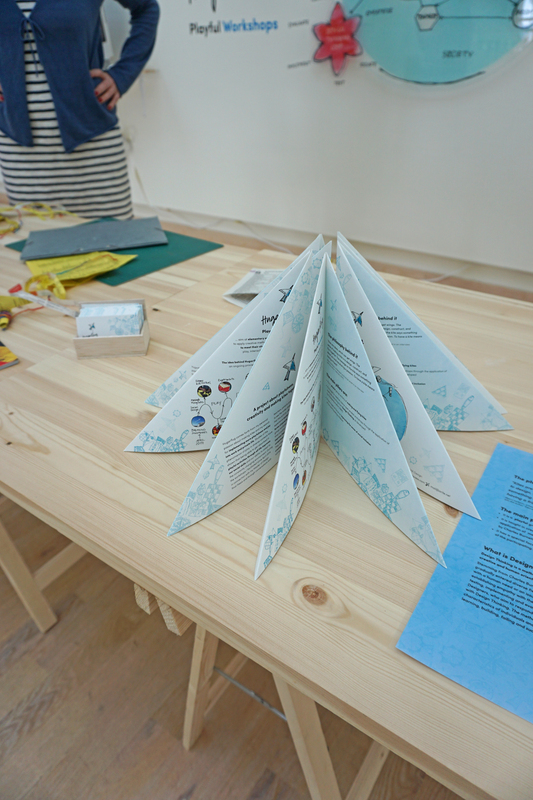 Far Vedere L’aria = Making Air Visible: A Visual Reader on Bruno Munari. Baden Baden: Lars Müller Publishers, 2000. Orlandi, Ayşe E. Coşkun. “Experimental Experience in Design Education as a Resource for Innovative Thinking: The Case of Bruno Munari.” Procedia – Social and Behavioral Sciences 2, no. 2 (2010): 5039–44. “Pattern of Play.” National Institute for Play. Accessed November 30, 2014. http://www.nifplay.org/science/pattern-play/. Pelham, David. DuMont’s Bastelbuch der Drachen. Köln: DuMont, 1977. Pilloton, Emily. “Teaching Design for Change.” TED video, 16:43. July, 2010. https://www.ted.com/talks/emily_pilloton_teaching_design_for_change. Razzouk, Rim, and Valerie Shute. “What Is Design Thinking and Why Is It Important?” Review of Educational Research 82, no. 3 (September 1, 2012): 330–48. doi:10.3102/0034654312457429. Sigurdardottir, Helga. Collaborative workshop of an elementary school teacher and a master of design student, April 17, 2015. “Skýrsla Barnaheilla – Barnafátækt Er Brot Á Mannréttindum Barna.” Accessed December 2, 2014. http://www.barnaheill.is/Frettir/Frett/barnafataekterbrotamannrettindumbarna/. “Socially Responsive Design.” WordPress. Oslo National Academy of the Arts, February 13, 2015. http://www.socialdesignresponse.com/goal-mission/. Material and decoration for a childrens workshop at the Iceland Academy of the ArtsThis workshop was a collaboration of 3 students. Convinced that we have not lost our playfulness, the graphic designer and kites expert Arite Fricke (https://aritefricke.wordpress.com/about-2/) offered a playful workshop for all ages, where got to learn to express ourselves through kites making. And to stay on the eco friendly side of things, we also learned what and how to reuse for crafting a kite. That’s how we found out that outdated phonebook pages make good material for a kite. 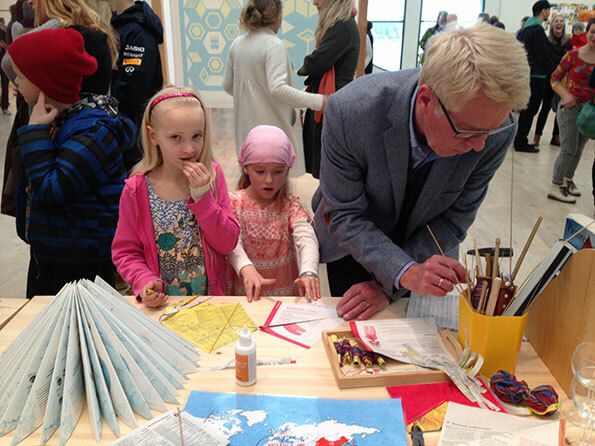 Our exhibition opens in Gerðasafn, Kopavogur April the 18th and stands until Mai 10th. Please book appointments for workshops through my email or 663 3763. Leikgleðin leynir sér ekki í verkefni Arite Fricke, þar hanga stórir flugdrekar úr loftinu fyrir ofan vinnuborð með bréfum og bandspottum. Hugmyndin er að skapa vettvang fyrir börn til að kynnast hönnunarferli í gegnum flugdrekagerð. Í verkferli hennar sjálfrar varð þó ljóst að flugdrekagerð getur tvinnað saman fjölbreyttar námsgreinar, til dæmis stærðfræði, listir, sögu, eðlisfræði og fleira. Verkefnið Hugarflug er mjög skemmtilegt og hún hefur þegar prufað að vinna það með börnum í Austurbæjarskóla, en markmiðið er að börn kynnist hönnunarhugsun með því að standa andspænis verkefni sem þau þurfa sjálf að leysa. Nemendurnir þurfa að vinna saman að því að setja saman flugdreka sem flýgur en það getur tekið nokkrar tilraunir og þróanir áður en allir eru sáttir við virkni hans og útlit. Lausnin á verkefninu kemur beint í æð því það er mikill sigur að sjá hlut sem maður hefur sjálfur skapað fljúga um loftið. Að hugsa í lausnum er nokkuð sem kemur sér alltaf vel, hvaða verkefni sem maður tekur sér fyrir hendur eða lífið kastar í fangið á manni.